For a civil engineer, it is of primary importance to customize the checkings performed on element forces or displacements. NextFEM Designer allows to handle and checks some defined quantities on nodes/elements by means of user-defined formulas. It is possible to customize the list of verifications with the notation described in the following. 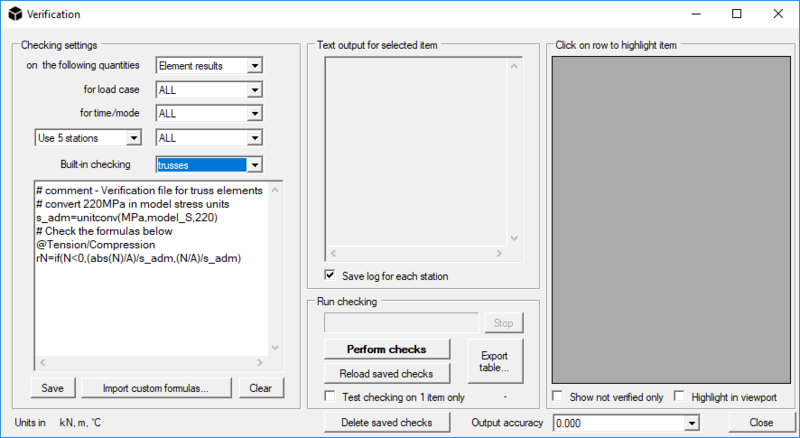 The text file containing checking can be placed in the “verification” folder in the program installation directory and must have the “.nvv” extension (see for example trusses.nvv). Such file can be edited with Notepad++ (notepad-plus-plus.org). A setting for the syntax highlight for Notepad++ can be found in the “verification” folder (NextFEMVerifications.xml). The checking engine supports the code execution in blocks. Each block is delimited by the identifiers as in the following example and must the named with a floating point number (0.6). execif(condition, 0.6): executes the code block named 0.6 is condition is true. unitconv: converts between units. Usage: unitconv(oldUnits,newUnits,Value). dz: transversal deflection in local direction z.
Rrz: nodal reaction around Z axis.